I guess you already shared your weather station data with all possible networks and now you want to customize and tinker with your own personal weather website. Or you have the weather software template, but you are already bored with it and want something different. In the next lines I will try to outline the most popular templates as of 2017. What is weather website template? Home weather station website template is predesigned collection of html pages, java script files, CSS files or PHP scripts that you can use to incorporate your weather data and display it on your personal website. They are used by weather enthusiast all over the world to share their current and historical weather data on the web. They are easy set and deploy, and remove the necessity to spend time learning web programming. ...you can change and customize these files to suite your needs. You don't need to rely on third party service rules. I assume you have all the necessary pre requirements like the hosting and domain. Read on and find what are the best free templates. 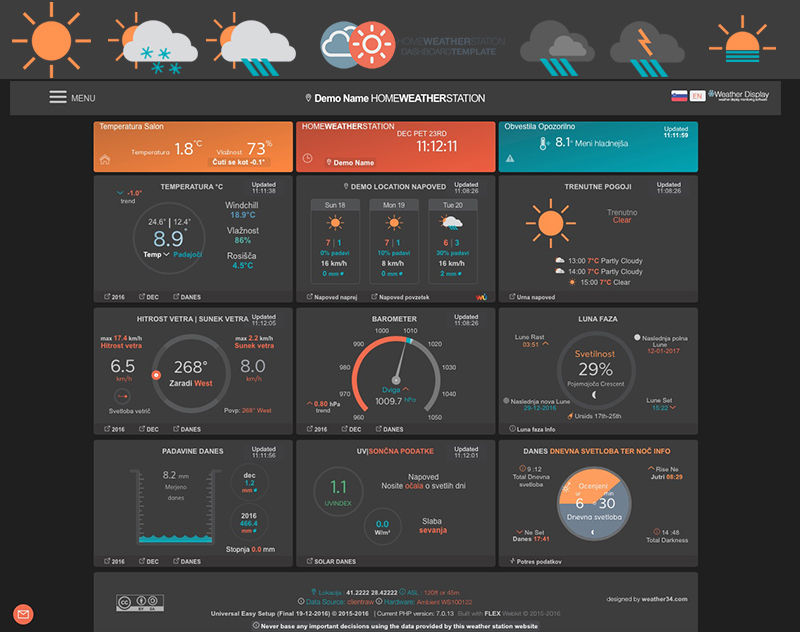 HOME WEATHER STATION web template is a beautifully designed, free weather website template developed by Brian Underdown. With it you will be able to use data generated by your weather station or your personal software and display it on your personal homepage in real time and without refreshing the page. You can easily connect with CUMULUS software, Weather-Display-Software, Meteobridge, Ambient WS1001 other weather tracking devices. The template however do not generate forecast data, so for that reason Brian added the option to connect with 2 external data sources - Weather Underground and Earthquake-Report.com . Recently, Briand rebuild the whole system to include option to change units, color scheme (dark and light), and new menu system. The new version gives you the ability to make many personal preferences in the settings. This allows to fine tune the way the template works. A grate new addition is the new daylight/night hours features including a relative real-time sun position and movement. One of the most valuable things about this template is the superb design. It is very balanced and very easy to use. The data is presented in clear and ordered fashion for a great user experience. 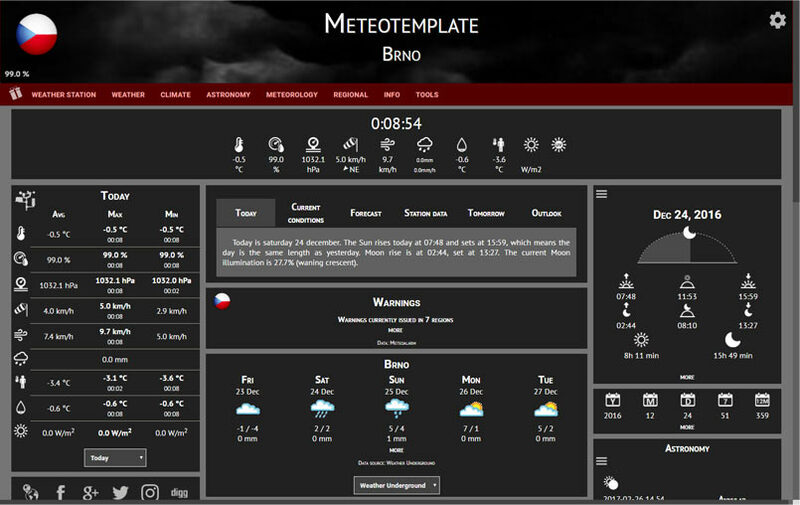 Metotemplate is a free weather website template created by the Czech weather enthusiast Jachym. The first release of the template was in April 2015 and ever since Jachym provide constant updates and tweaks for his software. Because of its good design, customizability, and lots of quality features – like plugins, languages and many more - the template became quite popular amount weather enthusiast around the word. Until now, more than 300 of them have used it on their personal sites. 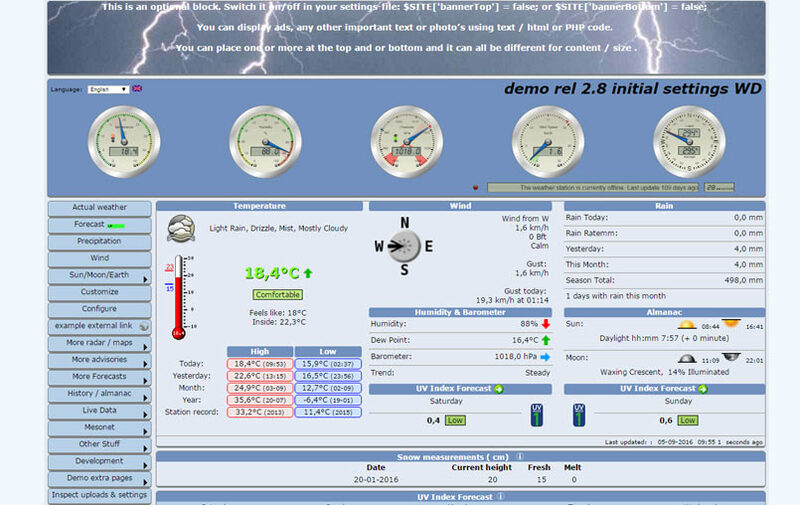 Metotempalte works with Weather Display, Cumulus or WeatherView. You can also use device that sands data directly to the Internet such as Meteobridge. It also possible to collect data form Weather Underground, Netatmo API or Weather link if you already upload you data there. Support of PHP - you serve must support PHP with at least version 5.4. MySQL database - this absolutely necessary if you want to keep track of the your weather data. There is history and trend section for tracking your past weather movements. The software has the useful data import feature - If you already collected some historical weather data the software gives you the option to import it. There are several possible ways to import the data, among which are - txt/CSV import and Weather Underground import. The database update feature provides the ability to populate the database with your own raw weather data. NetAtmo - with NetAtmo API. The control panel is easy to use and very intuitive and allows you to set up your template from one place. This page includes links to all the administration pages and is accessible after you log in as an administrator. Administration > Info Pages - change the info about your station, your homepage and the location where you live. Administration > Main Setup - the main setup of the template. Backup > Main Files and Settings - backup of your main setup, your update scripts, your desktop and mobile homepage layout and all the setting files for all the blocks and plugins. Empty cache > Station Data - Once you empty this cache, it will be recreated as you or your site visitors view the pages again. Administration > Plugin setup - of all your installed plugins. With this template you will have a highly customizable homepage with modular structure. You can set the number to columns, their size, and what blocks should load and there order. Each block is loaded on the homepage independently and loads his functionality to the it. Blocks are something like widgets with some functionality attached to them. Updating a block is really easy. and it is available through the Control Panel. Clock - Analog clock with current time, you can choose from the designs you see on the next image. Station Data - This block will show summary of all the parameters measured by your station. This includes the average, minimum and maximum. The user can change the interval (today, yesterday, this month, this year, all time etc.). The data refresh without the need to refresh the page. Current condition - current conditions reported by your station, updated in realtime. You can select to get the updates from the database or directly from a text file. Trends - This block shows you trends in various parameters. There is a little smoothened line graph and the overall trend for the selected period. Location - This block shows your station latitude, longitude and elevation, along with a link to a popup with an interactive map showing your station position. In the settings you can define the default zoom and map type. Lightning - This block shows a map with current lightning strikes, grouped by continents or for the entire world. The image auto-updates at the interval you specify in the block settings. Webcam - Using this block you can add images from your webcam(s) to the site. There can be unlimited number of them and you can specify the auto-update interval. ...and many more. Check the official block page for additional info. Another useful feature is that the template has two homepages, one for mobile devices, and one for desktop. This will guarantee that the page will be visible on all possible devices. A couple of words about the plugins system. You will have tens of different plugins for you to select from. Each one will add additional functionality and pages to your template. Unlike the homepage blocks, plugins don't appear on your homepage, they are separate pages that appear in your menu. They are very easy to install - download the plugin package, extract it and upload it to your server. Info pages - pages about your station, location and website. The content can be changed in the control panel. Languages - the template comes not only with English but some more predefined languages to chose form. Custom pages - easy and convenient way to add any number of custom pages. Just check the documentation for more info. This is one of the most popular weather website template currently available. Saratoga template is based on the static html Carterlake WD templates with additional AJAX real-time updates and modular PHP design. The templates has 800 pixels and full with design with built-in color/width style changer. A complete template consists of a Base (geographic location) and a Plugin (software). The thing that makes this template so good is the huge plugin section they will extend your site functionality with more features that you can imagine. Customizability trough CSS-and XML file. The Leuven-is e popular template used with more than 300 weather websites. It is 100% free and has a very good documentation and extensive Wiki pages. Similar to other templates in the list Leuven provides forecasting from a number of online services. like YrNo, MetNo, NOAA, EC, HWA, WeatherUnderground and WXSIM. One of the most helpful features included here are scripts from other sources that come pre-installed, and tested. This will save the website owner countless hours manual setting. When using WeatherUnderground you will be able to set - detailed reports and detailed graphs. The template has one version that supports all regions - Europe - USA and Canada and others. You can pploads multiple weather-programs. No setting is needed when switching from one weather program to another. Adaptable homepage with lots of components to choose and display. Weather-by-You is a website template developed and maintained by Jacques DesRoches. Cumulus for Windows - software with large user base and buzzing community that provide numerous weather data and is open to other languages with its "file processing" capabilities. All templates are easy to use and form the start to finish it takes no more than a hour to put e working website online. With them you can display all the necessary data provided by your weather station. On Weather-by-you website you will find additional resources like - icon, sets, gauges, and template variations. Now - live weather data with pressure, temperature, humidity, wind, wind direction, and rainfall amount. Sun and moon info is also available. Yesterday - summary of the data for the past 24 hrs up to midnight local time. Records - extreme recorded data since the site's inception. Trends - graphs that present temperature, pressure, rainfall, and wind speed trends for the last 12 hours. and thumbnail graphs are sampled every ten minutes.